The Springbok Tour of Aotearoa in 1981 opened up a chapter in our history when fundamental questions about colonisation and racism in Aotearoa were directly confronted by mass audiences for the first time. A tiny Trotskyist group entered this debate with the production of a pamphlet around a year later titled "Towards a Socialist Polynesia". Written by Owen Gager, the first professional (as in full time, unpaid) Trotskyist agitator NZ had seen, it argued that NZ could best be understood as a white settler colony (yet with pretensions of imperialist rule in the South Pacific) very much in the same mould as South Africa. It was then, the first serious Marxist attempt to subject the events of the Tour of 1981 to dialectical analysis, and a critique of the other attempts on the left to explain these events. It makes the point that white settler colonies are backward, racist outposts of empire, and that their future is one of reactionary racism until such time as they are transformed into socialist republics, in the case of New Zealand, part of a federation of Socialist Republics of Polynesia. Before making a couple of lengthy quotes which convey the substance of the argument about the white settler colonies and display its power as a critique of the conventional 'left' views of Aotearoa, some short account of the Spartacist League and its co-founder, Owen Gager, is necessary. After all, why would a revolutionary current emerge in such a backward, and as Gager used to say, petty bourgeois, British white-settler colony? As we might expect, left politics in small countries are heavily influenced by currents in larger countries. NZ as a small, dependent, colony had is own local minor echoes of Fabian, anarchist, IWW, Labourite, Stalinist and Trotskyist politics. Apart from a few sympathisers of Trotsky in the 1930s and a bogus rumour that rightwing 1950's union boss and dairy farmer Fintan Patrick Walsh was once a Trotskyist, Trotskyism in NZ originated in the 1960s around a few key individuals. Notable among them was Owen Gager who as an honours student of history in the late 1950s wrote a path breaking Marxist critique of the colonial suppression of the labour movement during the First World War. In the 1960s like many intelligent and revolutionary minded youth during that intense period of decolonisation, the bloody IndoChina war and 'new left', Gager became highly politically active editing the Victoria University paper Salient, and founding and editing at least three Marxist or Trotskyist magazines, Dispute, Spartacist Spasmodical and Red. Gager had discovered Trotskyism and made it his business to find out which was the best in keeping Trotsky's program alive. In 1970 he joined up with Bill Logan at Victoria University to form the NZ Spartacist League. As the name suggests this was a statement of solidarity with the international Spartacist current based in the US. But as everyone likes to repeat parrot-like where there are at least two Trotskyists there must be a split, so around 1972 Logan went off to the US to join the Spartacists while Gager rejected the Spartacists as pro-US imperialist and left for Australia to co-found the Communist Left, leaving his frustrations with 'petty bourgeois' NZ behind. Gager came back to NZ for around a year in 1982 largely as the result of the ferment stirred up by the Tour in 81. He helped revive the then dormant Tenants Protection Association in Ponsonby and wrote a number of pamphlets including Towards a Socialist Polynesia. One needs to read the whole pamphlet to realise what a ground-breaking work it was, especially the 'Leninist' critique of the other left currents, including the Maori nationalists around Donna Awatere and their chief nemesis, Bill Andersen. But his main contribution in this pamphlet was to build a Marxist theoretical framework for understanding NZ's place as a colony of British imperialism, and its role in the wider Pacific, and in particular the role of the pan-Pacific proletariat in making a socialist revolution. Here the concept of the white-settler colony was central to the argument. In the introductory section Gager ties in NZs intellectual and political backwardness with its colonial history. Any here South Africa is the appropriate explanatory model. Gager uses Marx's method of taking as his reference point the actual disruption of the Tour and then going down to the roots of this conflict in our common history. Of course a reading of the complete pamphlet is necessary to grasp the power of the argument. Gager begins by claiming that settler colonies like South Africa and NZ maintain a racist division between the indigenous and settler populations today because the indigenous populations still have some residue of their original mode of production and live in a semi-wage labour reserve army. Racism justifies this division while apartheid legalises it. The Tour served to highlight that in fighting Apartheid in South Africa the Pakeha left faced the reality of racism in this country; that South Africa showed Aotearoa its future.
" But while expropriation and continued land sales made possible the rise of commodity production, it was the survival of remnants of the Polynesian mode of production which made the super-exploitation of the Maori rural reserve army of cheap labour possible. Pre-capitalist forms of property in land and traditions of mutual economic support within tribes provided means of subsistence outside that which could be bought with wages in the market. This meant that Maori workers could be paid low wages (below the cost of reproduction of labour power in the market) and employed as casual or seasonal labour. As land values dropped further and more land was alienated, the dependence of the Maori rural reserve army on its own means of subsistence lessened but without any equalisation of the low wage and the ‘high minimum level” set by commodity production. The history of the super-exploitation of the Polynesian workers is the history of the continued existence of the Polynesian mode of production within the framework of the dominant capitalist relations of production. So long as the Polynesian mode of production survives within the hostile capitalist environment, the wages of Maori workers are forced below the value of labour power. While the continued possession of some Maori land may slow down the proletarianisation of the Maori people, it cannot prevent and has not prevented it. It ensures, on the contrary, that when Maori workers enter the proletariat, they do so on the worst terms, as the lowest stratum of the class. This is not the result of racism, though this process has produced and will continue to produce racism. It arises rather from the logic of a slow and protracted expropriation of a pre-capitalist mode of production by the capitalist mode, at every point representing continuous immiseration of the indigenous population as the value of Maori land declines and the amount of land owned is reduced in area and fertility. Similar processes take place in other Polynesian islands but even more slowly." "This [the South African case] as we have argued, is similar to the position in New Zealand. In both cases part of the costs of reproduction of indigenous labour-power is being met by the traditional labour of those (particularly women) outside the capitalist mode of production. South Africa’s development diverged from New Zealand’s in that the CMP displaced the petty commodity MOP in agriculture by force, a result of British imperialism’s drive to protect large-scale mining capital. The absence of any large-scale mineral or other raw material resources in New Zealand meant that massive capital investment such as in South Africa did not take place. This held back the development of industry and the rate of conversion of petty commodity production into capitalist agriculture, and allowed the survival of comprador small capital dominated by British finance, shipping and meat exporting capital. These differences however, are differences of pace and scale, not of substance. An accelerated concentration of capital in New Zealand and the South Pacific would utilise existing wage differentials between white and Polynesian workers to entrench an apartheid-like system. Under capitalism, South Africa represents the future of Polynesia." 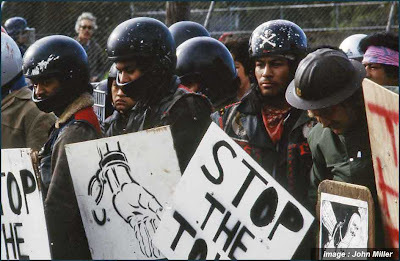 The next step in the argument was to show that the struggles of the indigenous peoples to defend their mode of production from capitalist incursion gave rise to a rich history of insurrections and wars, and after a series of failed national movements, the assimilation of the indigenous peoples into the reserve army of the proletariat as the best, most militant, and ultimately the leading layers of the revolutionary proletariat. Of course, the punch line is that this revolution must lead to a "Socialist Union of the Pacific". Polynesia (except Tonga) was annexed by various European powers in the nineteenth century, and the history of struggle against annexation is long and bloody. Throughout Polynesia, King Movements developed as forms of Polynesian self-government, following European monarchical traditions, initially under the influence of missionaries. These movements generally lacked the strength to control European land purchases, and their surrender to the market made inevitable their surrender to European governors. In Aotearoa, however, a King Movement developed after annexation rather than before it, against European opposition and using its monopoly of physical force in certain areas to control the activities of pakeha farmers. “…in London, Ratana was snubbed by his own High Commissioner, Sir James Allen, who was happy for the party to perform haka and poi dances at the Wembley exhibition but laughed when Ratana asked that arrangements be made for him to meet representatives of the British Government. This rejection deeply wounded Ratana and, standing on Westminster Bridge, he prophesied in the words used by Tawhiao: “When all your stone houses are destroyed in time to come, then will the carpenters, the blacksmiths and the shoemakers be in power and I will be the government.” Although their links with the labour movement have enabled the Ratana Church to play a continuing political role in Maori affairs, again it has failed to achieve its objectives through parliamentary means. What is needed is a Socialist Union of Polynesia! The revolutionary tradition of Samoa, Hawaii, and Tahiti – the history of uprisings against imperialism – must now directed beyond independence to socialism. Now that large numbers of Polynesian workers have been concentrated in Auckland and other parts of Aotearoa, it is there that they will exchange experiences and prepare for united revolutionary action. This pamphlet has concentrated on Polynesia since (with the exception of Tahiti and Hawaii) it is largely within the sphere of interest of New Zealand as a small imperialist power. A Socialist Polynesia would, however be only a step toward a Socialist Union of the Pacific." No doubt this pamphlet would benefit from being updated and corrected in some factual points today, yet as an historical document of its times, the fight against the '81 Apartheid Tour, and the Marxist lessons Gager drew about the roots of racism in both South Africa and Aotearoa, its stands proud as part of the Communist Workers Group's revolutionary heritage.